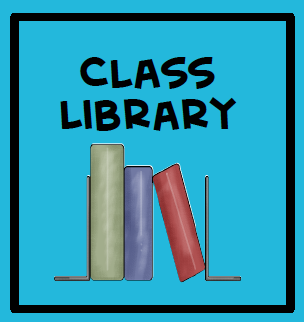 Class libraries, something all classrooms need, can be an organizational challenge. It seems like everyone has a different way of organizing their class library. Some prefer grouping books by authors, others by topics, while others prefer genres. No matter how you group your books, there are a few things I always try to include. Reading levels is one of the first things. The best websites I’ve found to get this information is Scholastic Book Wizard. This site gives you: interest level, grade equivalent, lexile level, DRA level, guided reading level, genre, topics, and a summary. All of this information at your fingertips for free! I write the grade equivalent level on the inside cover. Through the years, I’ve heard opinions from teachers who are for and against telling students their reading levels. To me it’s a philosophy . . . . a.k.a there is no right or wrong answer, it’s whether you make it work for you or against you. I’ve always had good luck giving my students this information. What I’ve found through the years is some parents think their child’s oral reading ability is their child’s reading level. This is a problem when the child’s reading comprehension level doesn’t match their oral reading ability. Or a parent will look at their child reading a really long book and assume he or she must be on a middle school or high school reading level (when they are in elementary school). Rick Riordan’s new book Red Pyramid, which is on a grade equivalent level of 3.7, is a perfect example. A 3rd grader reading this book might look impressive because it has over 500 pages of literary enjoyment. In reality, this book is on their grade level. You know the old saying don’t judge a book by it’s cover? It’s so true! Genre! Genre! Genre! If you teach older students you realize how important this word is. Many moons ago, when I began teaching first grade, there wasn’t a whole lot of emphasis placed on teaching genre. We might mention it, but not give it much attention. After teaching 3rd grade and helping my daughter’s sixth grade teacher, I can tell you that your fellow upper-grade teachers would be very happy for any extra help you can give on this topic. Why you ask? Genre can be a little tricky. Books can fit into more than one genre. Look at the Scholastic Book Wizard and you’ll see that many of the books that you look up have 2 or 3 genres listed under the title. As an additional little boost, I write the genre(s) on the inside cover of my books, under the reading level. Anything you can do will be appreciated! I love Scholastic Book wizard. I also like to use the Lexile wizard. It lets you print a list based on lexile levels and genre. Good tip! Thanks for the information. I use all those free address labels that I seem to get weekly in the mail. I tell my kids their reading levels. We use AR at my school and they are always SO proud when they can move to a higher level book.